Sound is an important issue in residential construction. Sound insulation tends to govern the choice of construction system because of its daily impact on quality of life. The references below provide information on acoustic considerations for timber-framed construction, including the sound-performance requirements for different classes of buildings within the Building Code of Australia (BCA). Areas covered include sound insulation of wall, floor and ceiling elements relevant to Sole Occupancy Units and surrounding construction; and assistance for those wanting to improve and upgrade sound performance beyond minimum BCA requirements, including low frequency impact sound, vibration induced sound and flanking noise. Design guide 2 - Timber-framed Construction for Multi-residential Buildings Class 2, 3 & 9c - information about complying with the fire and sound performance requirements in the BCA for Class 2, 3 and 9c buildings. Acoustic considerations in construction – guidelines and resources to assist with compliance for the BCA sound insulation provisions. Understanding sound transmission – by understanding sound transmission, adequate resistance to the passage of sound can be incorporated into building design. Standards and codes within Australia are controlled by the Australian Building Codes Board (ABCB), and the details and copies of the standards are available at the ABCB website. City Sounds 2 - Acoustic Design Resource is an initiative of the City of Melbourne and RMIT University. When designing a new or modifying an existing dwelling, all building work must comply with the National Construction Code (NCC) and any actions to reduce the ingress of external noise must be designed and constructed to be compatible with all other aspects of the NCC that may apply. 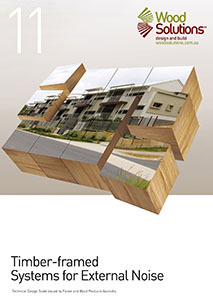 WoodSolutions Technical Design Guide 11 offers an overview of the key issues.